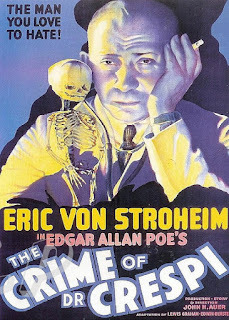 In 1935 Republic Pictures, home of those beloved movie serials, released the horror film The Crime of Dr Crespi, a lacklustre, plodding mad scientist revenge piece principally of interest only because it features the former bad-boy director Erich Von Stroheim as its lead and a rare non-demented turn from Dwight Frye. Based loosely on Poe’s The Premature Burial, it was directed by John H Auer who spent a long time with the studio culminating in TV shows like Whirlybirds. He co-wrote the script with two others, Lewis Graham and Edward Olmstead, which is hard to believe for what remains a very single-minded B picture. What the film boils down to is vengeance - carried out by Crespi upon his protégé, the eminent Dr Ross (John Bohn) who had stolen Estelle Ross (Harriet Russell) from him and now Crespi is seemingly the only man capable of life-saving surgery upon him. So far, ‘so hospital melodrama’. However, unbeknownst to Mrs Ross, Crespi goes through the charade of pretending her husband died on the operating table whilst actually administering a paralysing drug with the terrible side-effect of forcing his victim to experience his own burial – unable to move anything except his eyes, a payback “with compound interest”. The sequence of Crespi savouring his grisly revenge - “My friend – my very dear friend” he coos with velvety evil - is one of the few sparks of life in the tired unfurling of the plot, the blame for which rests largely on Stroheim. He spends most of the film reciting his lines in such an underpowered, conversational manner that it comes across as an actor’s boredom with the material. (The poster depiction of him smoking in a resigned posture is a very fair summation of his distracted performance). This may be due to the fall from grace he was recovering from, having previously been a prized and temperamental director of renown. The Austrian-born Stroheim had risen from modest Viennese roots that he later lied about in interviews, claiming to be descended from nobility. He began his Hollywood career working for D.W. Griffith as both actor and as one of the assistant directors on Intolerance. The immense scale of this epic would perhaps influence his own future grandiose ideas. World War One gave him an opportunity to make his name as various near-enough German-accented officers in films like The Heart Of Humanity. 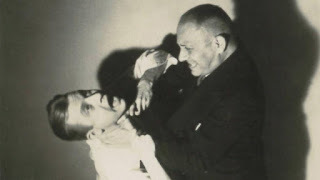 He emerged as a skilled director in the silent era with famous films such as Blind Husbands (1919 and the lavishly-budgeted Foolish Wives in 1922, but with a notorious penchant for tyrannical and arrogant behaviour. (The Hollywood stereotype of the jodhpur-clad bully barking orders through a megaphone is based on both he and Cecil B. De Mille). This, coupled with his exhorbitant demands, would be his downfall as no cost-effective studio will endlessly bank-roll an unreasonable director’s ‘vision’. The crunch came with 1923’s Merry-Go-Round from which Stroheim was fired. His replacement, Rupert Julian, would parlay this chance into going on to helm Chaney’s Phantom of the Opera the following year (see my Chaney serialisation of 12/2015). Stroheim’s most famous, indeed infamous work, was Greed based on Frank Norris’s novel McTeague, which ballooned to an original cut of ten hours. When Sam Goldwyn’s studio merged to become M-G-M, Stroheim found his film taken away from him to eventually be distilled down to just two and a half hours, an arguably ruinous editing . Sadly, we can never know for sure as the extra footage was irrevocably destroyed. Stroheim’s career almost went the same way due to his temperamental inability to compromise his needs in any way. He was fired from Queen Kelly in 1929 when Gloria Swanson could not get along with him. 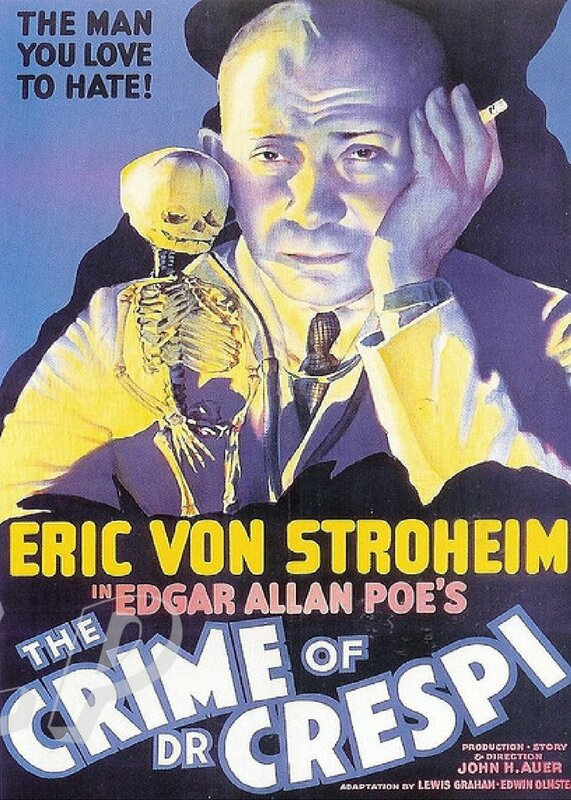 Between his illustrious heights as a director and his comeback for Wilder, movies like The Crime of Dr Crespi paid the bills for Stroheim if nothing else. This particular one certainly doesn’t repay close attention and he trots out his lines with a barely functional presence when not required to move along his hideous scheme. Dwight Frye attempts to inject a serum of energy into proceedings as the suspicious (of Crespi) Dr Thomas. Whilst it’s gratifying to see him escape from the typecast confines of the gibbering henchmen that made his name in Dracula and Frankenstein, Frye is soon incarcerated again when Crespi strangles him into unconsciousness and dumps him in a side room while he undergoes the pretence of attending the funeral as a respectful mourner. Thomas teams up with Dr Arthur, (Paul Guilfoyle, who went on to The Grapes of Wrath and White Heat among other classics in a long career) and together they revive Ross, who shambles down the hospital corridor, his zombified appearance shocking the duty nurse who was just moaning about the boring shifts she works there. The movie culminates in a shoddily rushed and confused ending in which Ross enters Crespi’s office, to no surprise whatsoever from his tormentor, and dies slumped in a chair. Thomas and Arthur rush in, but by now Crespi/Stroheim is so jaded with the film that he matter-of-factly declares it’s all over and shoots himself. “Crespi!” gasps Thomas, with perplexing sensitivity toward a chap who only shortly before had throttled him and stuffed him in a closet. At least Frye gets a nice epilogue flirting promisingly with the nurse, while the audience has the feeling of a very unsatisfying end to a date. The Crime of Dr Crespi is ultimately not one of murder, but artistic negligence.